Pictured at the launch of the 2019 KDM Hire Cookstown 100 in the Mid Ulster town are Kenny Loughrin and Norman Crooks of the Cookstown Club, Rebecca Carson, John Caddoo and Lynsey Turkington of KDM Hire and top road racer, Michael Sweeney. Picture: Stephen Davison. Tobermore’s Adam McLean is eyeing a strong start to the new Irish road racing season at this month’s KDM Hire Cookstown 100, which was launched last night. McLean is one of the sport’s hottest properties and the young prospect has been focusing on building his experience with the McAdoo Racing Kawasaki ZX-10R during pre-season testing. He twice finished on the podium at the opening round of the Ulster Superbike Championship last weekend at Bishopscourt, with McLean using the event as preparation for the first roads meeting of 2019. The 22-year-old was the man of the meeting at Cookstown last year, winning the Supertwin race and claiming two podium results in the Supersport class. McLean said: “I’ve been doing a fair bit of testing and we were over in Spain in March. I’ve been getting the miles done on the big bike, which is what I need this year. “I didn’t know I was going to Bishopscourt until the night before the race, but I thought I might as well go along and get some more track time. A strong line-up also includes Dublin’s Derek Sheils on the new-look Burrows Engineering/RK Racing Suzuki. Sheils has been the man to beat in the Superbike class around the Orritor course in past seasons and true to form, he picked up another victory last April in the Open race. 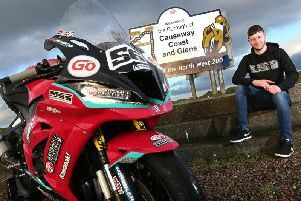 The feature Cookstown 100 race was cancelled due to poor weather, but Sheils will be gunning for a big bike double this month on the GSX-R1000 for John Burrows’ team. He will also line-up in the Supersport races on the Roadhouse Macau Yamaha R6. Mullingar Missile Derek McGee is also entered and the triple Irish champion will have a busy schedule as he competes in the Open, Supersport, Supertwin and Moto3 races. McGee, a runner-up in the Lightweight race at the Isle of Man TT in 2018, is feeling in confident mood for the upcoming season and he could be the man to trouble Sheils in the Superbike races. Martin Jones Racing’s Michael Sweeney is another top southern Irish rider who is also a leading contender in the Open, Supersport and Supertwin classes, while Magherafelt’s Paul Jordan will get his campaign underway at Cookstown, where he will ride his own 600 Yamaha in the Open and Supersport races. Jordan has signed for the Dafabet Devitt RC Express Kawasaki team this season for the major international road races and impressed at Kirkistown last weekend, finishing on the podium in both Supersport races. There was big news last month with Lincolnshire’s Guy Martin announcing his intention to compete at Cookstown in the Classic race on his home-built BSA Rocket 3 machine. Martin hasn’t raced competitively on the roads since the Isle of Man TT in 2017, but the TV star and celebrity remains as popular as ever and is sure to be a hit with the fans. A host of newcomers is headed by former Senior Manx Grand Prix winner Tom Weeden, who has replaced Davey Todd in John Burrows’ team, while Adrian Harrison – brother of TT and Ulster GP winner Dean – also makes his debut on a Kawasaki ZX-10R. Dutch lady Nadieh Schoots will also don the newcomers’ bib as she prepares for her first taste of Irish national road racing after racing at the North West 200 for the first time in 2018. 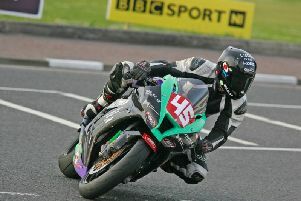 Schoots has entered the Open and Cookstown 100 races. Retired road racer Paul Robinson will take on a different role as he runs former 50cc short circuit champion Sam Grief on his Moto3 Honda. A reduced race programme sees 12 races on Saturday, April 27, while the first Open race will be held following qualifying on Friday evening, April 26. Following on from a number of incidents last year, the organising Cookstown & District Motorcycle Club has undertaken resurfacing work around the course from Craigmount to Braeside, while the starting grid has been moved further along and will be situated adjacent to the exit of the pits.